Uncle Brian and Marmaduke the Magic Rabbit meet a variety of puppet characters during their search for Marmaduke's long lost rabbit cousin at the Haunted Castle. The show opens with an 'It's behind you' pantomime routine as the ghost, who is a friendly looking Caspar style, pops up and down at various windows in the castle. Two or three boys and girls win balloon wands which they use in an attempt to be ghost busters. This leads into the puppet show with lots of audience participation and interaction between the children and characters of the puppet show. Next the audience is split into two sides to cheer support for children invited out from the audience to take part in a fun competition involving giant block building. The final act of the pantomime is the magic part of the show. A spell is needed to reveal the long lost rabbit cousin. This production was introduced by Uncle Brian at Castle Howard on May Bank Holiday 1998. Have your own stage production with a set up of 11ft x 7ft, comprising a haunted castle and a keep from which the puppets appear. Uncle Brian and Marmaduke the Rabbit meet a variety of puppet characters during their search for Maraduke's long lost rabbit cousins at the Haunted Castle. Children invited out from the audience to take part in a fun competition. Finally a spell is needed to reveal the long lost rabbit cousins. This production introduced by Uncle Brian at Castle Howard on May Bank Holiday 1998. 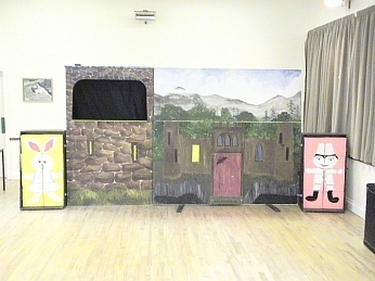 A stage production with a set up of 11' x 7' comprising a haunted castle and a keep in which the puppets appear. Each show lasts an hour. By and large for a full day affair the artist alternates one hour on, one hour off for spells longer than a single show.